The Greece-Bulgaria front was quiet. 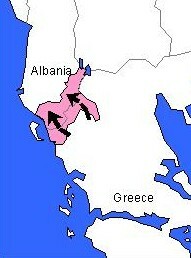 This allowed Greek C-in-C, Alexandros Papagos, to transfer the bulk of his forces to oppose the Italian invasion coming from Albania. Despite the Greek’s lack of armour and inability to oppose the Italians in the air, early December saw a string of Greek successes. 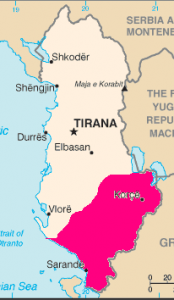 On 3 December, the Greeks crossed the River Kalamas (in north-western Greece) and entered the Albanian village of Sarande. The following day, they reached Permet, taking large numbers of Italian prisoners. 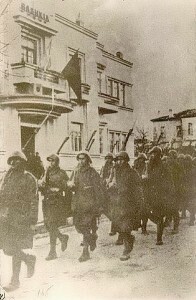 The picture above left shows Greek troops marching through the Albanian town of Korce. On 6 December, with the Greeks fully in control of Sarande, the Commander-in-Chief of the Italian armed forces, Marshal Badoglio, resigned. Although small, the Greek army was better clothed than their opponents and also better trained for fighting in the harsh, mountainous terrain. But the Greeks were not motorized, and so in no position to exploit their success. Even so, they had forced the Italian C-in-C to resign in disgrace, and caused Mussolini’s prestige to sink to an all-time low. Hitler would eventually come to the rescue of his friend. Britain was beginning to send help to the Greeks, in the form of troops, the navy, and the RAF, but little had arrived to-date. 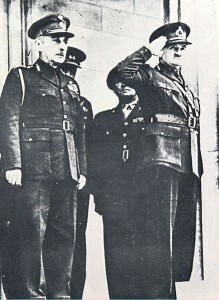 The picture to the right shows Greek general, Alexandros Papagos (left) with British general, Archibald Wavell (right), the latter being C-in-C Middle East and C-in-C of the British Expeditionary Force to Greece. This entry was posted in World War II and tagged Albania, Badoglio, Greece, Mussolini, Papagos, Wavell. Bookmark the permalink.